Samsung’s Single Level Cell (SLC) Solid State Drive (SSD) is an advanced NAND flash-based solution for traditional storage, leveraging the company’s longtime leadership in memory technology. This next-generation solution offers several advantages over rotating magnetic media such as significantly lower power consumption, remarkable ruggedness, high reliability, less weight and outstanding performance. According to iSuppli, approximately 25% of notebooks will have solid state storage by 2010. The S.S.D. system is currently selling as an alternative high-end storage device for notebooks by many major PC manufacturers. The 64-gigabyte model surpasses a key storage threshold for business users; according to surveys, this is adequate storage for approximately 80% of professionals. The SSD’s weight is almost 25% less than that of a conventional hard drive, thus further increasing easy system portability. The device also uses significantly less power—about 0.41W in operational mode and 0.24W in standby mode. This gives users up to 10% more battery life. The drive currently comes in SATA II or PATA versions and in 2.5-inch and 1.8-inch form factors. Samsung’s Solid State Drive performance is 200% greater than traditional storage.1 For example, the 64-gigabyte model boots up in 36 seconds versus 63 seconds for traditional hard drives. Applications launch 1.5 to three times faster, depending on the specific application. In addition, random search times are about three times faster on the SSD, which is not subject to fragmentation and maintains its performance over time. As a non-volatile storage device, the SSD has no moving parts such as the motor, disks and heads of a hard drive. Thus it eliminates spin-up time, seek time and rotational latency while delivering sustained high-speed data transfers. The SSDs lack of moving parts makes it noise-free and its ultra-low power consumption virtually eliminates heat emissions. The SSD is also highly rugged, standing up to shock and vibration while performing in temperatures from 0°C to 70°C. These performance features make it well suited to a broad range of users. These include “road warrior” business professionals, as well as those in demanding military and industrial areas. 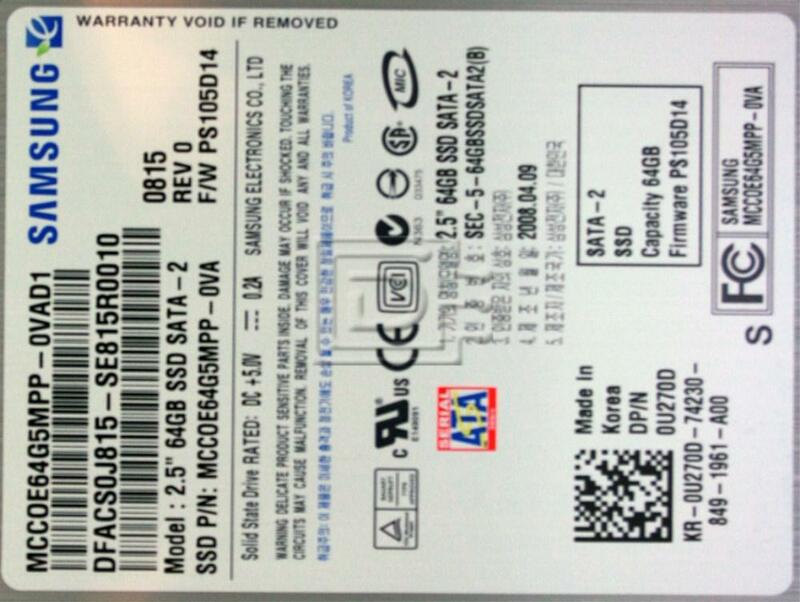 Samsung designed the SSD’s footprint to be interchangeable with a hard disk drive. Standard SSDs are available in 2.5-inch and 1.8-inch form factors with storage capacities ranging from 32 to 128 gigabytes. Furthermore, because the SSD is form-factor agnostic, the flash components can be arranged to meet virtually any size or shape configurations. This Solid State Disk (SSD) is compatible with all laptops. 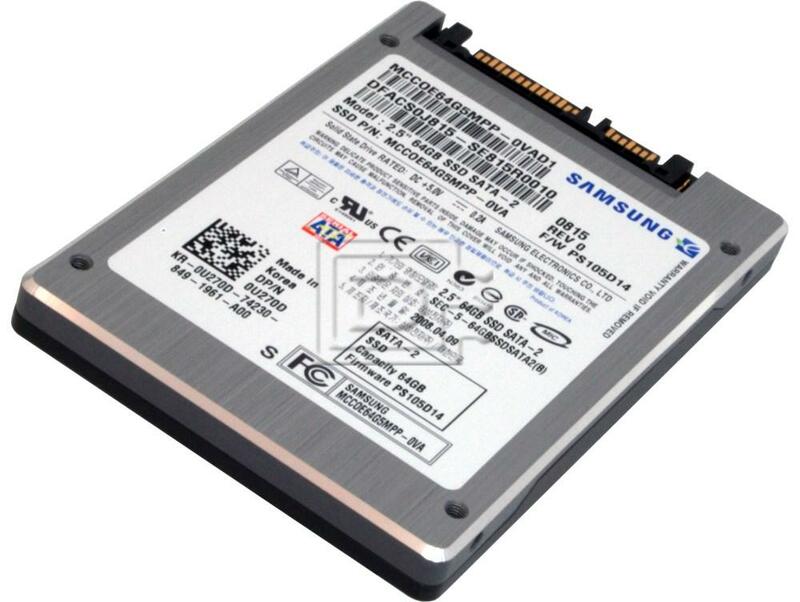 Model Name SLC SSD SATA 3.0Gbps 2.5"